Neil Jukes insists the Leigh team of 2016 is far better equipped to challenge for a Super League place than that of last year. Last Sunday, Centurions lifted a third successive Kingstone Press Championship League Leader’s Shield with a thumping 58-0 win over Dewsbury at the Sports Village. 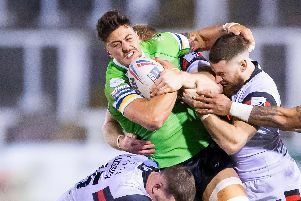 But the Leigh coach (inset) was not getting too carried away with the celebrations and was already thinking about the middle eights, which gets under way in a fortnight. “This season has been all about improving as a team week to week and I think we have done that,” said Jukes. “We have become closer as a group and the new players have helped to freshen things up after a turbulent start to the year on and off the pitch. “We have more strength in depth and over the last eight weeks we have been able to rest a lot of players and try to get the balance right. There are good people who didn’t play against Dewsbury like Gareth Hock, Tom Spencer, Brad Fash and Sam Hopkins and we have options with our pivots which we didn’t have last year. “We showed that we fight till the end. To nil a team in our last game shows how hard they want to work for each other. “Already we are thinking about the middle eights by trying to be smarter with possession. Rather than run the ball on the last tackle, we are kicking it to the corners. We are being more respectful of the football and the key stat is completions. Saturday, August 6: London Broncos, home. Saturday, August 13, Salford, home, Sky Sports. Sunday, August 21, Featherstone, away. Saturday, September 3, Hull KR, away, Sky. Saturday, September 10, Huddersfield, home. Saturday, September 17, Batley, home. Friday, September 23, Leeds, away.